In the nineties we went to Crete to celebrate my late grandpa’s 70th birthday. We went to a kinda café-restaurant-ish place in a village he and my grandma had been to before. They instantly recognized him and after some pleasantries and most likely some customary Raki (booze, usually home-made), we decided to have dinner there that same evening. It wasn’t a big establishment. We had to decide what to eat so they could go kill it in time for dinner. You know, that sorta place. We decided on chicken and came back a couple of hours later. I vividly remember two things about that meal. One. From the start the waiter was a bit… off I guess I’d say. The second time he came in… was he drunk? The third time, yes, decidedly drunk and now he also started to apologize profusely. He couldn’t sing to us you see, “I’m very sorry, I can’t sing for you… I’m so sorry”. After a while we understood that the village was in mourning. The waiter cried and apologized. No singing. Two. The chicken and rice. Crispy, lemony, wonderfully roasted chicken with some kind of risotto-ish rice. Creamy and lemon-infused. It was all just really, really great. So, back to Sweden. A bunch of years later, my dad started to make a lemon tasting, greek style chicken thing, but with potato instead of rice. I just assumed that this was a riff on that memorable meal. Turns out, it was from a recipe booklet he got from our part-greek cousins. That doesn’t really matter though. What matters is this: that chicken and potato is the bomb. And, ironically, the star of the show is the potato! Don’t get me wrong, the chicken is great, but I tend to think that roasted chicken can only be that good. The potato though… beyond great. What’s also great with this dish is that it’s so, so simple. It needs some time in the oven but takes very little time to prepare. If you’re feeling ambitious, I’d recommend you to brine the chicken over night. Dissolve approximately 60g of salt per one (1) liter of water. Put the raw chicken in the salt-water (the brine) and let it soak over night in the fridge. As the ion concentration in the brine is higher than the water in the meat, salty water will go into the chicken (osmosis) making it more juicy and naturally a bit salty (well… maybe a bit of a stretch to call it naturally). For pork, chicken (birds in general) and fish this is a really awesome trick. One more thing. About that soured cream: in Sweden it’s called “gräddfil” and is very common. The closest international equivalent I’ve found seem to be soured cream but I’ve never actually tried it myself. Note that it isn’t the same thing as creme fraîche although that is fairly similar. Gräddfil is about 12% fat, soured cream about 18% and creme fraîche is a lot fatter. If in doubt, just use more of the yogurt instead. So, onwards to the instructions! 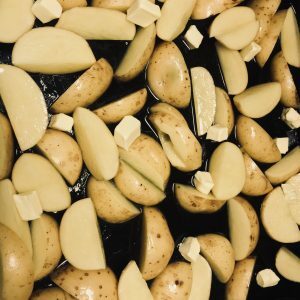 Cut the potatoes into quite thick slices and put them in an oven tray. Pour 100g (1 dl) of olive oil over the potatoes. Turn the potatoes in the oil a couple of times thus that the potato slices are well covered in oil. 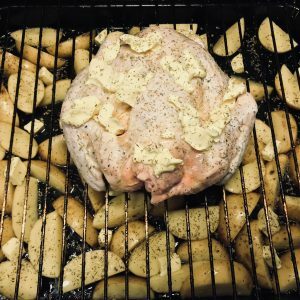 Place the chicken on an oven grid and put the grid on top of the tray of potatoes. Press a lemon worth of lemon juice over the chicken, splash it with some olive oil and distribute 50g of butter across the skin of the chicken. Sprinkle some salt and black pepper over the chicken. Press the other lemon over the potatoes, pour the water into the oven tray and distribute the remaining 50g of butter amongst the potato slices. Sprinkle oregano quite generously over everything. Put into the oven for 30 minutes, then take the whole thing out, turn the potatoes and flip the chicken over (belly up). Put everything back into the oven for about 60 more minutes (depending a bit on the size of the chicken). Now you’re done with that! 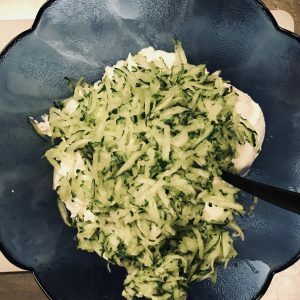 Over to the Tzatziki. Put the yogurt and the soured cream in a bowl. Grate the cucumber and press it to remove excess water. Press the garlic cloves and put the garlic and cucumber in with the yogurt. Add 100g of olive oil (1 dl) and the vinegar (1.5 tbsp) and mix everything together. Add salt and pepper to taste. Done! Serve with a nice Greek salad and make sure to pour some of the juice from the oven tray over the chicken and potatoes on the plate. The roasted chicken dripping down into the lemon-butter-olive oil makes for a truly great dressing. I hope I get to that original Crete dish some day. I’ve tried making it a couple of times but haven’t really been able to mimic the rice. In the meantime though? Eat this for christ’s sake.